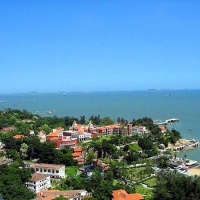 Known as the “garden in the sea”, the Gulang Island (aka the Drum Wave Islet, local name: Gulangyu) is situated southwest of Xiamen, separated from the city proper by the less-than-1000m wide Lujiang Strait. The total area of the island is 1.78 sq km. seen from the sky, the island is oval-shaped with curving edges. It is a harmonious combination of natural scenery, green trees, colorful flowers, straits, islets, Sunlight Rock and the statute of Zheng Chenggong, etc. 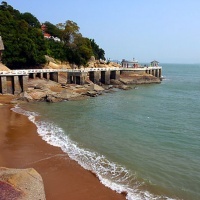 One the beach of the Gulangyu there is a huge rock with a big hole in the center. When the tides rise, the waves are heard pounding against the rock with a thunderous boom. From this small islet derived its name. Buildings on the island are in various styles, such as traditional Chinese temples with upturned eaves, one-storied house with yard are usually found in South China, small and exquisite Japanese residences, European-style buildings with red tiles and big slopes, the “Eight Diagrams” buildings which is also known as the “Little White House”, the Catholic church with tapering roofs, and many villas which are combinations of Chinese and western styles. The island can be called an architectural museum which contains buildings of different countries and different times. The famous scenic spot, Shuzhuang Garden, which combines the beauty of the mountain and the sea, is a wonderful work of Chinese landscape art. On the summit of the Dragon Head Hill, Sunlight Rock is the highest spot on the Gulang Island (aka the Drum Wave Islet), with an altitude of 96 m. It is actually an enormous rock whose diameter is over 40 m. It was here that the Ming dynasty general and national hero Zheng Chenggong once directed the training of his navy. So a memorial hall was built at the foot of the Sunlight Rock to contain his relics and remind people of his heroic deeds and spirits. 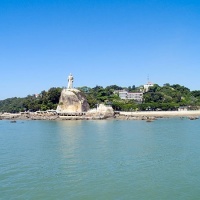 Standing at the top of the rock, you will have a panoramic view of both sides of the Egret River (Lujiang), the Drum Wave Islet with dense forests, the city of Xiamen with a forest of high buildings, the giant ships in the sea and mist farther in the distance. On Mount Longtou are Chinese phrases carved in the Ming and Qing dynasties, which mean the blessed land of the Drum Wave Islet is the most beautiful scenery of Lujiang. Nestling under the Sunlight Rock is a temple of the same name, which is also called “One Title Name”. It got its present name of Sunlight Temple because when the sun rises in the morning, the temple will bask in the sunshine. The peaceful environment and beautiful scenery provide the inhabitants special sense of music. It has the reputation of being “Islet of Music” or “Islet of Piano”. The first one to welcome visitors at the Drum Wave Islet is a piano-shaped harbor, which looks as if playing a welcoming music, accompanying the waves. Like the beautiful scenery on the island, the music here has also become a rare and special musical “spot” in China.